The scene of another fatal high-speed collision on a highway in South Africa. Vehicles flash past a homeless man begging at a busy intersection in Johannesburg. The sun has burned gold streaks into his stringy brown hair. Donovan Hermans lives here, under trees at the side of Empire Road, warmed by filthy blankets reeking of exhaust fumes, cloaked in chemical smog. He’s often the first person on the scene of the many crashes that happen here. “I’ve seen bikes come down; bikers [killed]; I’ve seen cars trying to make turns wiped out by buses or [minibus] taxis; hell of a lot taxi accidents here,” said Hermans. He recently saw a woman killed trying to cross the road. 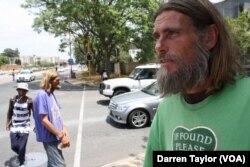 Homeless man Donovan Hermans at an intersection in Johannesburg that’s notorious for road crashes. “She’s walking on the island and her phone rings; she takes it out her pocket, answers her phone, takes one step into the street; bus hits her in the face, smashes her face completely. That bus was going too fast, it couldn’t stop,” Hermans explained. 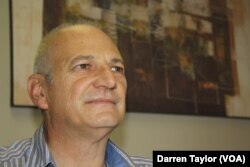 Voorendyk said two words summarize what he’s seen in eight years on South African roads. 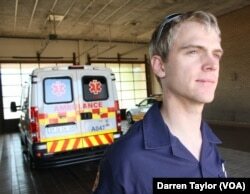 Paramedic Victor Voorendyk says he sees “disorganization and chaos” on South Africa’s roads, and is often witness to death and serious injury. His colleague, Ian Watson, has been working the roads for the past 16 years. South Africa’s Justice Project, a non-profit, monitors the country’s traffic system and its implementation of road laws. Chairman Howard Dembovsky, a former police officer, said the injuries and deaths because of road smashes are a “national tragedy” that the country’s citizens and authorities aren’t taking seriously. Justice Project South Africa chairman Howard Dembovsky, a former police officer, says the country’s not doing enough to improve its poor road safety record. “More people are dying on our roads than die in the Middle East in war-torn countries, per day!” he scoffed. The government said about 14,000 people lose their lives in car crashes in South Africa every year. But independent analysts, like Dembovsky and Carol Smit of the South Africans against Drunk Driving group, dispute this number. “If you’re looking at the statistics from the mortuaries, it’s more likely 20,000 or 25,000 a year,” said Smit. 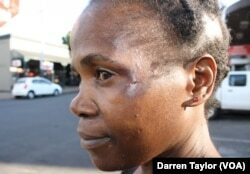 This woman carries the scars of a near-fatal car smash, like many thousands of South Africans. The Justice Project said the yearly death toll is “at least” 21,000, based on s analysis. Tens of thousands of others suffer severe and crippling injuries. Dembovsky said South Africa’s official annual road death toll is too low for a good reason: Its Department of Transport (DOT) only records “immediate” fatalities, and is failing to register the deaths of people who perish from injuries up to 30 days after a traffic accident — even after it pledged to do so in 2010. DOT spokespeople did not respond to repeated requests for comment about the statistics and road safety in general in South Africa. The WHO’s 2015 Global Road Safety Report, based on 2013 statistics provided by governments and released in October last year, rated Africa’s roads the world’s deadliest. The continent is home to 40 of the 50 countries with the highest road death tolls. The WHO put South Africa's road fatalities per 100,000 people at just over 25, a little below the African average of 27. Dembovsky questions that number but said WHO is right in its assertion that South Africa’s “very good” traffic laws aren’t being properly enforced. “Law wise, South Africa is right up there with the rest of the world. Enforcement wise, South Africa is right down there with Kenya, with Nigeria, not least because many of our law enforcers are corrupt,” he said. 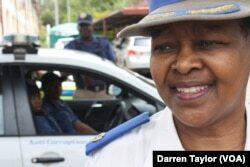 Veteran traffic officer Superintendent Edna Mamonyane says her department needs more manpower to confront the chaos on the roads. According to Justice Project research, there are now 11 million licensed drivers in South Africa.